Schurco has been remanufacturing and repairing Nash Vacuum Pumps for decades. All repairs are done on site at our facility in Jacksonville, Florida. 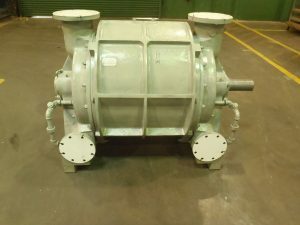 Our comprehensive remanufacture process of all Nash Vacuum Pumps consists of; a complete breakdown and analysis of your pump, the ability to repair or replace your shaft and rotor, if necessary; and restoring the rotor-cone tolerances to OEM factory specifications. We also have experience dealing with all different types of material, including clad vacuum pumps. At the conclusion of our repair, we will have restored your Nash Vacuum Pump and the vacuum level as if the pump was just purchased from the factory. At our facility, we maintain an inventory of several sizes of Nash Vacuum Pumps from CL-2000 up to the CL -9000. All repairs are guaranteed with the 2-Year Limited Warranty and we also have units available for a Pump Exchange program. If you have a Nash Vacuum Pump which needs repairs or are in the market for a used remanufactured unit, give us a call today, our engineers will be able to assist you.